On the 3rd of January 2000, this site was the proud winner of 22 Awards. Officially declared Shipper Friendly, Mulder Friendly and Mulder Addict. Church of X member. Proud winner of a Beth Award! Go visit Beth's X-Files site! I can die happy now. Go visit Elliot's X-Files site! Go visit Squall's Spooky Corner! Go visit Jenna's Gillian Anderson Page! 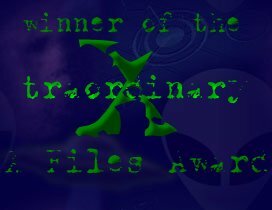 X Traordinary X-Files Award. Mama! Go visit The X Traordinary X-Files Site. The X-Philers Award. Ah! Ah! Go visit The X-Philers Site. Go visit The Truth and the Love Site. 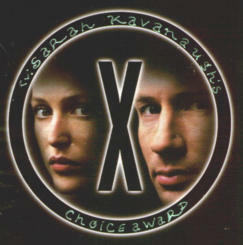 X-Files Excellence Award. Yeeee Ha! Go visit The Iceprincess's Realm. Go visit "The Void" and its great X-Files Page! Jeff's X-Files Award. La La La La La! Go visit Jeff's XF Site. 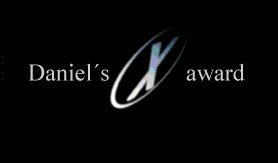 Daniel's X-Files Award. Yahoo! Go visit his XF Site. Award of Spookiness! Bim Bam Boom! Go visit Scully Clone's site! "Oh, impatient one", her award. is the best of sensations. Go read great MSR at Frogdoggie's Site. You gotta love that silly picture. and white, don't miss it!! behind the door of Apartment 42? Come browse the Files of X! Don't wait and X-Hale here! A world you'll love to be lost in! This site was chosen as best of the French Tripod "TV Pod" for 2 weeks!!! !